It started with Pizza Hut, McDonalds and the rest of the fast-food giants, but now franchises have become one of the fastest-growing business types in Australia, racking up a turnover of more than $2 billion a year – or 15% of GDP. More often than not they are seen as an easy way for people to start their own businesses, with an estimated 70,000 franchises now operating across the country offering everything from lawn-mowing services to bookkeeping. While most attention is usually paid to those looking to buy a franchise, not much is given to those small businesses owners who want to franchise their own business. 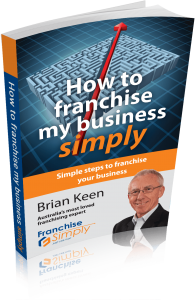 Yet the founder of ‘How To Franchise Simply’, Brian Keen, says that many businesses in regional areas of Australia could easily become franchisors, selling their successful business model to the rest of the country and even the world. He quotes regional successes such as Wet-Seal, a Coffs Harbour company that, since its humble beginnings manufacturing canoes in 1985, has become one of the leading providers of waterproofing systems with 120 franchisees in Australia and New Zealand. And there are many similar examples he said, where small business owners have ddeveloped a business opportunity that lets others run their own successful business working for themselves, but not by themselves, with Jim’s Mowing being one of the many examples. After buying his first franchise in the early 1980s, Mr Keen soon became a multi-unit franchisee and then a consultant working for a large number of well-known groups such as Jim’s Mowing, Ultra-Tune, Donut King and Pet’s Paradise. He also established several of his own franchise systems. Mr. Keen, is now training people how to realise the franchise value of their businesses and helping them through the process step-by-step using his unique insights gathered from experience across the whole of the franchise spectrum.